As many of us around the world move into the colder months of the year, we bundle up our emojis with scarves 🧣, coats 🧥, and gloves 🧤, prepared for the freezing snow ❄️ and icy winds 🌬️. We also gather around a toasty fire, or 🔥 Fire, an emoji that burns bright and keeps us digitally cozy during autumn and winter. 🔥 Fire, yes, represents that luminous, smoky combustion we call fire, which gives us light and heat and cooks our food—and, more seriously, wreaks such tragic loss and destruction, as we’ve seen this month in California. But for all the literal fires we mark with it, we more often spark up 🔥 Fire for our many metaphors of it, from the expression on fire to the slang term lit. So, on this Emojiology, let's learn how to build a 🔥 Fire emoji. Depicting a reddish-yellow flame, 🔥 Fire is used to convey, beyond literal fires, a range of figurative expressions connected to fire. This includes senses of "excellent" (lit), "attractive" (hot), "scathing or searing" (sick burn), or "performing exceptionally well" (on fire), among other senses. Drawing on the phrase on fire, Snapchat displays 🔥 Fire next to two users who are on a snapstreak, or have been messaging for more than three consecutive days. 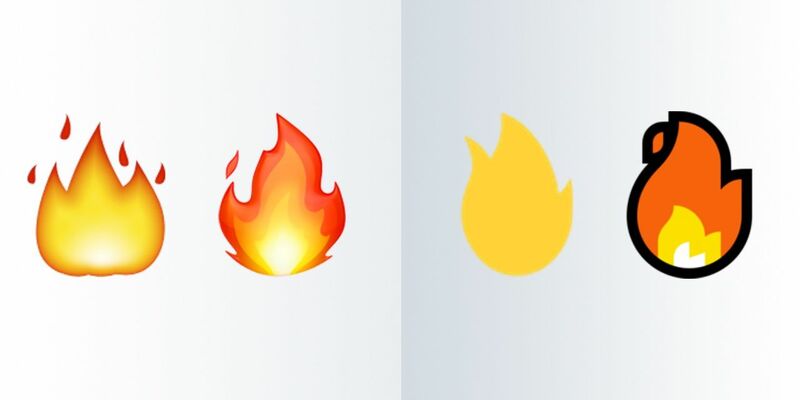 🔥 Fire was first added to the Unicode Standard in 2010 but had ignited emoji keyboards in Japan much earlier than this. Its appearance across platforms is fairly uniform, displayed as a flame with reddish-orange edges and whitish-yellow core, as flickering on a candlewick or burning in a campfire or fireplace. 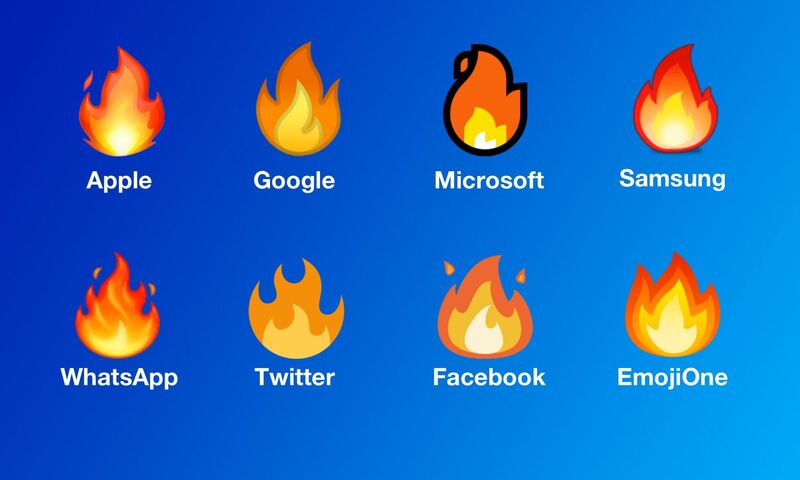 Above: How Fire displays across major platforms. Its appearance over time has also mostly been uniform, too. For iOS 10.2, Apple updated its 🔥 Fire to look more realistic than its slightly cartoonish predecessor. Microsoft, for its Windows 10 Anniversary Update, gave its previously flat yellow 🔥 Fire some reddish-orange depth, more in line with Apple’s look. Above (left to right): Fire on Apple's iOS 6.0 (2012) and current iOS 12.1 (2018) and Fire on Microsft's Windows 10 (2015) and current Windows 10 October 2018 Update. By 2012, users joined 🔥 Fire to one of the leading slang terms of the 2010s, lit, or something "excellent" or "extremely exciting," as if it's on fire. Around this time of year, the phrase lit can take on a double meaning when used in reference to the lighting of the 🕎 Menorah for Hanukkah. 🕎🔥 Tonight will be LIT! Happy Hanukkah to all those celebrating!! Lit spread from black slang into the mainstream by 2015, when the massively popular social app Snapchat helped further spread 🔥 Fire. That year, Snapchat introduced a host of emojis to characterize the status of users' relationships on the platform. It began displaying 🔥 Fire next to the names of users who were on a snapstreak (or simply streaks). That's when two users have both messaged each other back and forth within 24 hours for more than three consecutive days. On Snapchat, the number next to 🔥 Fire (e.g., 273 🔥) indicates how many days the two have been on the streak, and if it is about to run out, ⌛ Hourglass Done will appear to encourage the pair to keep the run alive. And folks have, with streaks reaching into 1000s of days. In 2016, 🔥 Fire was yet further fanned thanks to the expression dumpster fire, or "an exceedingly diastrous or chaotic situation," as defined by the American Dialect Society (ADS). In January 2017, the ADS chose dumpster fire as its 2016 Word of the Year due to its prominent use during the US presidential election that year. The ADS also noted dumpster fire found creative visual representation in 🗑️🔥, joining 🗑️ Wastebasket with 🔥 Fire. 🔥 Fire can make us all warm and cozy, as if creating some hygge around the hearth. #HappyThanksgiving Eve everybody! I finnallllly finished all of my kitchen prep for tomorrow & now it's time to relax w/ @tupps_brewery tasty spiced imperial stout in front of the cozy fireplace. 🔥😊 May all of your tomorrows be blessed. 🤲 Cheers! 🔥 Fire can turn us on, as if we are drooling 🤤 over a hottie. 🔥 Fire can spice up 🌶️ our food and scorch our mouths. Feeling like your look is on point? 🔥 Fire. Or that a comeback was a sick burn? 🔥 Fire. Above all, 🔥 Fire emoji is lit (“awesome”), conveying that someone or something is “excellent,” “desirable,” “wonderful," or "spectacular" in some way, from puppies to performances. In its applications to the slang lit, 🔥 Fire is often paired with 💯 Hundred Points, which doubles up the sentiments of greatness and satisfaction. As the examples show, we purpose 🔥 Fire for our many fiery feelings and figures of speech more so than pointing to factual flames. This is, in great part, because we understand that emojis are meant to be fun and expressive, making them often feel inappropriate if we apply them to more serious circumstances, such as California's wildfires. ...but, again, their sense is more often figurative, conveying that something is so metaphorically hot or lit that its fire has to be put out. The above tweet also shows that other explosive emoji help turn up 🔥 Fire's metaphorical heat, including 💥 Collision (e.g., banging or popping), 💣 Bomb (the bomb or bombshell), and, another recent addition, 🧨 Firecracker (dynamite). And when joined with 🎇 Sparkler and 🎆 Fireworks, 🔥 Fire typically communicates celebrations and congratulations. Real fire, of course, is useful, powerful, and deadly serious. But when it comes to its emoji representation, we, well, like to play with 🔥 Fire. That's pretty 🔥. John Kelly is a Senior Emoji Lexicographer at Emojipedia; compiling, writing and editing emoji definitions found on Emojipedia.org.